WITHIN THIS extraordinary memoir, Radhanath Swami weaves a colorful tapestry of adventure, mysticism and love. Readers follow the former Richard Slavin from the suburbs of Chicago to the caves of the Himalayas as he transforms from young seeker to renowned spiritual guide. The Journey Home is an intimate account of the steps to self-awareness and also a penetrating glimpse into the heart of mystic traditions and the challenges that all souls must face on the road to inner harmony and a union with the Divine. Through near-death encounters, apprenticeships with advanced yogis, and years of travel along the pilgrims path, Radhanath Swami eventually reaches the inner sanctum of Indias mystic culture and finds the love he has been seeking. It is a tale told with rare candor, immersing the reader in a journey that is at once engaging, humorous and heartwarming. Radhanath Swami was born in Chicago in 1950. In his teens he set out to wander the world on a spiritual quest where he eventually discovered the yoga path of devotion. He presently travels in Asia, Europe, and America teaching devotional wisdom, but can often be found with his community in Mumbai. People who know Radhanath Swami speak of his dedication to bringing others closer to God. Almost in the same breath they speak of his lightness, simplicity, and sense of humor. Visitors and friends are inspired by his unassuming nature and natural unwillingness to take credit for the works he inspires developing communities, massive food distribution to indigent children, missionary hospitals, eco-friendly farms, schools, ashrams, and emergency relief programs. He seems to see life as a continuous blessing of Gods grace, one admirer said, and yet he never loses his humanness. His accessibility leaves people feeling that with a little sincere effort, they too will find the path to inner peace and God realization. 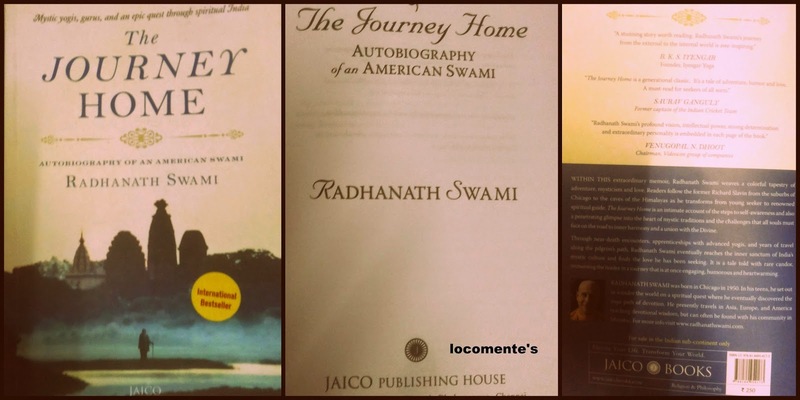 The book, being an autobiography, is all about how an American named Richard comes to India… takes the spiritual path and becomes Radhanath Swami. This book is his journey and his quest for spiritual enlightenment. The cover page is very simple. It has silhouette of temples and a lonely man. It is serene and gives a gist of what is in store in the book. The book blurb equally gives away the plot. The font is really good; it doesn’t make us strain our eyes at all. The book is divided into four parts and the chapter titles are poignant and interesting. Disclaimer: I am not a big fan of non-fictions and worst when it comes to autobiographies. So, I was not very excited to read. But, the book amazed me. Something pulled me into it. It let me get drowned into it and allowed me to swim through the author’s journey. I read the book for long stretches taking few breaks. The words of author, his situations and his experiences awed me. The simple narrative and vivid experiences never bores. Each page has something new in store. There are wise words and several enlightened characters. One of the characters who stole my heart is Ghanashyam. He is a devotee of Sri Radha – A selfless servant of God who sees fellow human as God’s friend. He dedicates his life in serving God and God’s friends. Further, I liked author’s description of Afganisthan – A place which has suffered a lot and often ignited memories of plight and terrorism. But, the author has described how nice the people are. The author tells us how content they are in spite of poverty and also about their desire to share! In short, some books transforms you. It urges you to become a better person. The Journey Home is one such books! Towards the end, he narrative starts to lose its charm. It tends to be redundant. I wish that it was edited more crisply because this could be because the book has about 350 pages! I heartily thank ThinkWhyNot for giving away this book review. Oops! Reading books can be addictive.